Taken from Terebaru 1986. Translation by Toshiaki Yamada. I create stories while I am drawing. It is rare that Akira Toriyama and Rumiko Takahashi, the two most popular mangaka in Japanese manga history give interviews, but we had an opportunity to talk about manga and anime with them. First of all, we asked them to tell us about their new anime Dragon Ball and Maison Ikkoku!! You are both writing very different stories than your previous series, going from Dr. Slump to Dragon Ball and from Urusei Yatsura to Maison Ikkoku. Please give us some comments about this? Toriyama: For one thing, I wanted to change tempos and structures so as to draw a clear line between the old and new series. For example, I drew Dr. Slump in an American-like style and am writing Dragon Ball in a Chinese-like style. Takahashi: Eventually, if you don’t change the tempos of your stories, making a new story becomes meaningless. And sometimes I can draw new manga because I changed tempos. Toriyama: It would be difficult to draw manga if you don’t change your stories. So, what elements did you take special care with when you changed the tempos of the stories? Toriyama: I made it a rule not to play around this time. I reduced play-things as much as possible. When I wrote Dr. Slump, I really played with my stories. For instance, I myself appeared in the manga…(laughs). But this time the story is important. Takahashi: I have wanted to write apartment stories for awhile. In the past I lived in an apartment in Nakano. And next to my apartment, there was another strange apartment on the verge of collapsing. So, is the life at that apartment the inspiration for Maison Ikkoku? Perhaps, your room was empty like Godai’s. Takahashi: Yeah! There was nothing more than what was necessary for living. These days’ people don’t live in shabby houses like that. In my mind, I imagined just a bed and stereo, etc. Toriyama: I often take my ideas from my experiences as well. 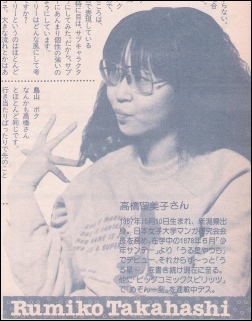 Takahashi: Speaking of which, I think it was a few years after Maison Ikkoku began its run. One day I went back to my hometown, and for some reason I read my diary from my high school days. I was really convinced that the writer of this diary was destined to write Maison Ikkoku. And I thought that showed through there. How do you create your characters, their appearances and natures? Takahashi: At first I consider characters’ nature roughly when I design them, but I don’t know the small details of about the characters before I start drawing. How about you, Toriyama? Toriyama: I decided to write a story about an energetic and serious boy. I depicted his energy through his hair and expressed his seriousness through his face and his eyes. I made it a point to draw his eye in a similar way to the sub-characters’, so I did not create very noticeable sub-characters. How do you make stories? Takahashi: I don’t have clear ideas for them. Of course, I have a rough sketch, but at any rate I try drawing and then I get some idea all of a sudden, I guess. Toriyama: My way is very similar to Takahashi’s. I take things as they come and I don’t really have a plan about the story. What if the storyline gets inconsistent? Toriyama: I went through such hardships when I worked on Dr. Slump. But I think that’s the attraction of manga. Takahashi: If you are constrained by your own plans too much, you can’t have your characters play their roles. Toriyama: I’m not persisting with frameworks. Dragon Ball was originally a story of China, but these days I draw places such as Bali, Siberia and western-like places, whatever I feel like. If you think of the story as occurring in a big continent, you can create such stories logically. When I am in trouble, sometimes rejected drafts are useful, and sometimes I create new characters. 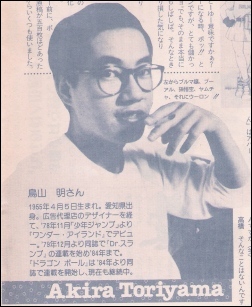 Osamu Tezuka said on “NHK Tokushu”, an NHK show that he could not get ideas until around deadline days. How about you two? Takahashi: Sometimes that’s the case, but in my case I often take two days to create a story and draw rough drafts, and then I think I take one night to finish them off. Toriyama: In my case, I vaguely think I have to make some stories and two days pass. But actually I just pretend to work on the story. And I think I spend about a day drawing it in pen. You two publish your stories every week, so have you ever run out of ideas? Toriyama: Yeah! I sometimes run out of ideas. In that case I make up my mind and go to bed (laughs). Even you Toriyama-sensei sometimes run out of ideas!? Toriyama: What do you mean? (laughs). If I get some good ideas with sleepy feelings, I think I’m lucky, but after that I often fall asleep. In that case I feel as if I have missed out on something (laughs). Takahashi: We have to write something anyway... And do something (laughs). For instance I add different flavors to stories by describing characters’ minds. Takahashi: So you have a lot of good material, don’t you? Toriyama: No kidding! When these drafts were rejected, I was really depressed. But I call it even when I take advantage of them later. Takahashi: When I did not have good ideas for Urusei Yatsura, I created some new characters to breathe fresh life into it. So, in both of your manga there are a lot of characters. Takahashi: You may be right. But Maison Ikkoku is the story of an apartment, so I can’t create too many characters. Takahashi: That’s not the case... When I started to write Urusei Yatsura, I was interested in science fiction. But my first editor said that “love triangles” were the most interesting. Toriyama: Yeah! Your first editor always has an impact on you that lasts for a long time. In my case, it was “to write manga that is easy to understand”. Takahashi: I agree with you. I feel as if “love triangles” are a part of my body (laughs). Toriyama: I planned for Dragon Ball to be aimed more at older readers than Dr. Slump was. I discussed the storyline with my editor and we actually created some stories. But the new storylines are the same as Dr. Slump in the sense that it should be “easy to understand”. Takahashi-san, why did you choose the shonen genre as your profession and not the shojo genre? Takahashi: Because I had read Shonen Sunday since I was a little child. Of course, I read some shojo such as Margaret as well, but I liked shonen manga when I was at an impressionable age, and I was familiar with the shonen genre since I was a child. When did you decide to become a mangaka? Takahashi: I think it was in the second year of high school. Toriyama:I wanted to keep it a secret, but I planned to submit my drafts to Shonen Magazine at first, but I found the deadline had already passed, so I had no choice but to send it to Shonen Jump. The reason why I became a mangaka… to be honest, I just wanted the 100,000 yen prize (laughs). What makes manga funny is “space”, but in the case of anime you must make characters very active. Do you often watch anime, you two? Toriyama: I seldom watch anime, and I don’t read manga very often either. I know they’re funny, but I am not keen on watching them. So, you don’t watch your own anime either? Toriyama: When they started airing, I was curious about them and recorded them on video tapes. Takahashi: I also record every episode on video in low definition mode. Even though I don’t watch them so often, I record favorite episodes on a special video tape. And I watch them in the middle of night in private (laughs). I do stuff like that. What do you think is the attraction of manga and anime respectively? Toriyama: I want to see movements, colors and sounds harmonize with each other in anime. As for manga, koma-wari, or panel arrangement is important. Takahashi: I think so too. Urusei Yatsura was a grandly scaled manga and I often could not draw my ideas on a limited space of paper. But I like to see those ideas that I can’t draw on manga pages described in anime. It is often the case that one anime episode contains about three chapters of original manga stories. What do you think about that, as a manga creator? Toriyama: Because anime and manga are different than each other, I prefer they do things that way rather than making unnatural “durations” in anime. I want them to fill up the durations by moving characters properly. Takahashi: I agree. But I don’t want them to rearrange stories so much that I can’t understand where some story lines came from. The important thing is the eagerness of anime creators since it is designed to appear on TV screens. Do you go to theaters to see your own anime films? Takahashi: I always go to see trade shows. I was especially looking forward to seeing the first movie and found it better than the original story. That was very nice!! I was very satisfied with the film as a manga creator. Toriyama: I’m too shy to see my anime in the theater. It’s embarrassing. Takahashi: I don’t think so. Toriyama: Speaking of which, you released an OVA of one of your short stories, didn’t you? Takahashi: Yeah! It’s Fire Tripper!! Toriyama: How much involvement did you have in the creation of the film? Takahashi: I just created the original story. I was really happy because they created the video according to the original manga more precisely than I had expected. They took my original manga story very seriously. I appreciate it very much and I’m very happy with it. They did a very good job and I thought if there was something wrong with the video, it will be my fault. Do you want to create your own anime? Toriyama: When I watched the anime Future Boy Conan before, I thought I want to make an anime by myself. But I don’t want to do it now. Takahashi: I like watching anime, but creating them is another story. I would rather draw. Did you want to make any comments about the creation of the anime adaptations of your works? Toriyama: I want them to make Goku move very aggressively. That’s all I want to say. Takahashi: I think the success of the anime depends 50% on the voice actors. I have worked with Kazuo Yamazaki before on Urusei Yatsura. I think he is rather good at Maison Ikkoku, so there’s no need for me to give him any comments. I’ll leave it to him. Toriyama: If they can make the story more attractive, I’ll allow them to change it from the original story. In conclusion, please give us some words about your new anime. Takahashi: Elementary and middle school students!! I bet you will really regret it if you don’t watch!! Ahaha! And don’t forget to read the original manga stories. Toriyama: Perhaps, each episode is not easy to understand, but I think you will find the rhythm and tempo of the story if you watch every episode. So never fail to watch it!! And the manga is on sale too, please keep that in mind! !